Energy conservation initiatives and efforts to promote widespread use of new energy sources are being pursued in a variety of fields in order to reduce CO2 emissions and prevent global warming. On the energy conservation front, these activities include the introduction of more efficient household appliances and office equipment as well as a move toward electrification with high-efficiency motors in transport, as typified by hybrid automobiles. Alternative energy initiatives consist of efforts to promote widespread use of alternative energies such as solar and wind power. These efforts will be increasingly important worldwide in coming years. The need to achieve dramatic increases in the efficiency of energy-saving and alternative energy products is increasing the importance of measurement, not only as part of the evaluation process during product development and manufacture, but also in maintenance inspections. In addition to high accuracy throughout a broad frequency range, these applications require easily portable power meters capable of measuring motor efficiency and harmonics. HIOKI has responded to these needs by developing a current sensor-driven power meter suitable for use in applications ranging form development to maintenance and service. The company's development of a new high-speed power analysis engine-a key device for this type of instrument-enables the 3390 to deliver high accuracy throughout a broad frequency range in a compact, lightweight design that is capable of simultaneous high-speed measurement. The POWER ANALYZER 3390's ability to deliver the industry's highest power measurement performance makes it ideal for use with the high-efficiency motors used in hybrid automobiles and electric vehicles, an application that requires 200 A class high-current power measurement capability. 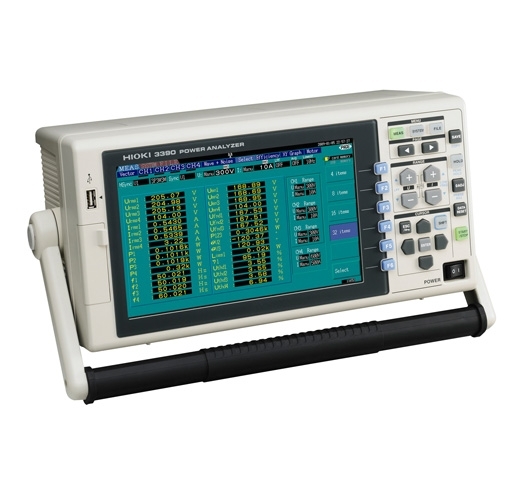 The POWER ANALYZER 3390 is a high-precision broadband power meter designed exclusively for use with current sensors. 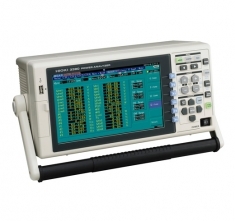 The instrument is ideal for use in applications ranging from development and evaluation to on-site measurement of devices including inverter motors, energy-saving equipment, and power converters.